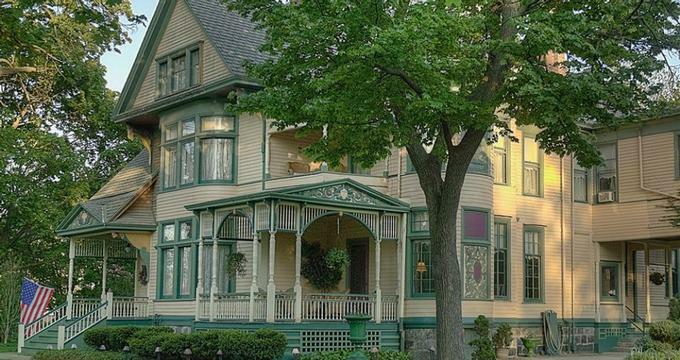 The Oliver Inn Bed & Breakfast is located in South Bend and offers a tranquil haven of comfort and relaxation. Exuding an elegant Old World grandeur, the 25-room estate was once home to the Oliver family for over 100 years and stands as a local historical landmark today. The beautifully preserved Inn features a stately circular drive and grand porte-cochere, and exquisite Victorian interiors, offering an enriching glimpse of life in Indiana at the turn of the century. The Oliver Inn boasts charming accommodations in the form of 25 guest rooms and suites that have been individually decorated and furnished to create havens of relaxation and tranquility. Guest rooms feature king or queen size beds, private bathrooms with marble showers and jetted whirlpool tubs for two, and luxurious amenities such as LED televisions with cable channels and DVD players, surround sound systems, air-conditioning and wireless Internet. The Oliver Inn is situated in the town of South Bend, which has a wealth of attractions and activities ranging from arts and entertainment and fine dining to lovely parks, plazas, and museums. The Oliver Inn Bed & Breakfast features beautifully appointed, individually decorated guest rooms with romantic Victorian décor and furnishings, private en-suite bathrooms with marble showers and jetted whirlpool tubs. Each guest room enjoys luxurious amenities, including customized bathrobes, LED televisions with cable channels and DVD players, sound systems and CD alarm clocks, direct dial telephones, alarm clocks, hairdryers, iron andironing boards, and air-conditioning. Wireless Internet is available in every room andthroughout the property. The Carriage House is a charming 1912 Bavarian Tudor-style retreat on the second floor that features two bedrooms and two bathrooms and a fully equipped kitchen. Bathrooms have marble showers and two-person jetted bathtubs, while a spacious living room boasts comfortable seating, an electric fireplace, a LED television with cable channels and a DVD player and surround sound system. The living room opens onto a lovely veranda with outdoor seating that is the perfect spot for relaxing over a glass of wine. The James Oliver and Knute Rockne Suites feature hardwood floors and original curved glass windows, king-size beds with plush linens, and private bathrooms with heated flooring and towel rails, double rain showers, and two-person whirlpool tubs. Spacious living rooms have gas fireplaces, LED televisions with cable channels, DVD players and surround sound systems. The Knute Rockne Suite features an antique claw foot bathtub with overhead rain shower head for two. Once a private sewing room for Gertrude Oliver Cunningham, Gertrude's Dressing Room features a queen-size bed with beautiful linens and a private bathroom with walk-in shower and two-person whirlpool tub. Modern amenities include a LED television with cable channels and a DVD player and surround sound system. The Vincent Bendix is a lovely sunny room with three large windows and beautiful views of the Carriage House and Gardens. Boasting original pewter Queen Victoria sconces, this room features a queen-size bed with nice linens, a private bathroom with a shower-over-bath combination, and modern amenities such as a LED television with cable channels, DVD player and surround sound system. The Clem Studebaker is a beautiful large suite with a king-size bed in gorgeous linens, and a private bathroom with original claw foot tub, walk-in shower with rainfall showerhead, two body sprays, and a handheld shower, and heated towel rails. Modern amenities include LED television with cable channels, a DVD player, and surround sound system. Guests are treated to a sumptuous breakfast every morning in the elegant dining room. The Oliver Inn also offers a traditional Afternoon Tea to groups of 10 or more, which feature homemade delights such as seasonal quiche, freshly baked scones with jam and cream, homemade tea breads such as pumpkin, almond and poppy, banana and chocolate, assorted sandwiches, fresh fruit and miniature desserts like pecan pie, cheesecake, shortbread and chocolate truffles. 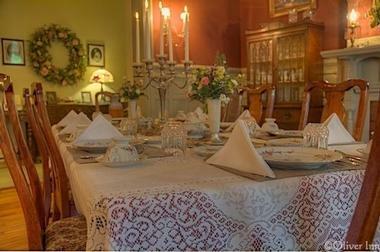 The Inn also serves lunch and dinner and appetizers and brunch menus are available upon request. The charming town of South Bend offers a wealth of things to see and do. The Downtown South Bend area is home to over 70 shops and boutiques, over 50 restaurants and cafés, four excellent museums showcasing the history of the region and a variety of arts and entertainment. There are also several lovely parks and plazas for relaxing and enjoying the outdoors, as well as a range of excursions, tours, and experiences.